There’s no limit to what the human imagination can create. Even if the tools we’re given were designed for a completely different purpose, there are people out there who can flip those around into something beautiful, even awe-inspiring. Like flecks of sand flung far inland in the wake of a hurricane, old military bunkers litter the landscapes of our nations, discreet reminders of a century of war. And where some people see cold memories etched in gray concrete, others see a canvas, stretched and ready to be painted into a promise of the future. Here are 10 bunkers and bomb shelters that have been recycled into something more fitting of our modern age. During WWII, Frankfurt, Germany became one of the nerve centers of the war, and the city suffered no less than eight bombing runs by the Allied forces. It’s no surprise then that the area is filled with WWII era bunkers, even today. On the East harbor of the city lies an industrial labyrinth of old warehouses, buildings, and quite a few of those old bunkers. The German architecture firm Index Architekten took one of those bunkers and converted it into state-of-the-art music recording studios. The bunker itself is the square concrete block on the bottom of the picture above, and the recording studios are located in the section built on top of it. In designing the structure, the original plan was to house the studios down in the bunker, but the roof had suffered major structural damage. Rather than replace it, they made the decision to fabricate the entire studio section out of wood and perch it on top of the bunker. 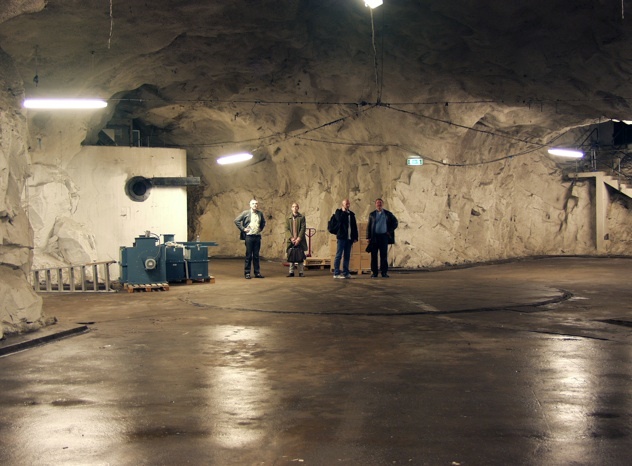 Musicians can record there, then walk down to the living facilities located in the bunker proper. The New Dutch Waterline was built as a defensive shield over the course of centuries. It started in the 17th century, when the Dutch began flooding specific regions of their land to protect key cities. These massive moats were perfectly planned—too deep for foot soldiers to cross, but not quite deep enough to accommodate ships. 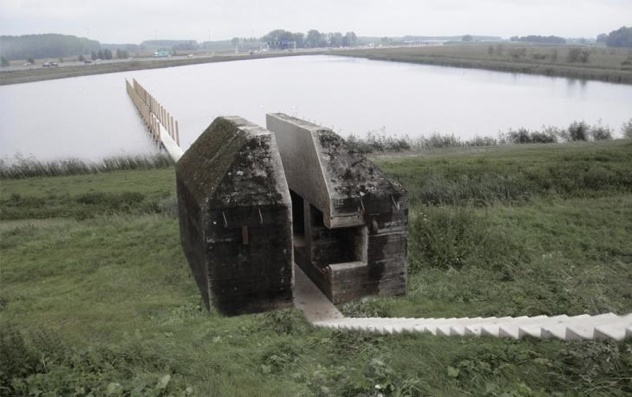 During the first and second World Wars, the Dutch further fortified these regions with rows of bunkers and pillboxes to protect their defenses against artillery strikes. This example isn’t as visually striking as many of the other entries on this list, but from a historical standpoint it provides a wealth of information. In 2010, Rietveld Landscapers cut through one of the remaining bunkers, Bunker 559 (there were 700 in total), giving tourists a cross-section view of the inside—a slice of history, so to speak. A stairway leads down to the bunker and runs directly through the middle of it, before leading out across the waters of the natural preserve in the background. In the heart of Shanghai, China, an approximated 2,000 leftover bomb shelters lie dormant from the tense period between China and the Soviet Union during the 70’s. In recent years, the government has released many of these bunkers to the public, and they’re being put to good use. 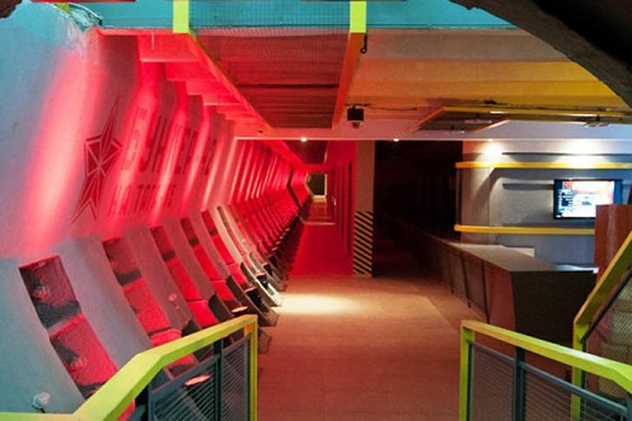 One of the most striking examples is The Shelter, an underground nightclub that was built inside the framework of a 600 square meter (6,500 sq. ft.) bunker in the Xuhui district of Shanghai. 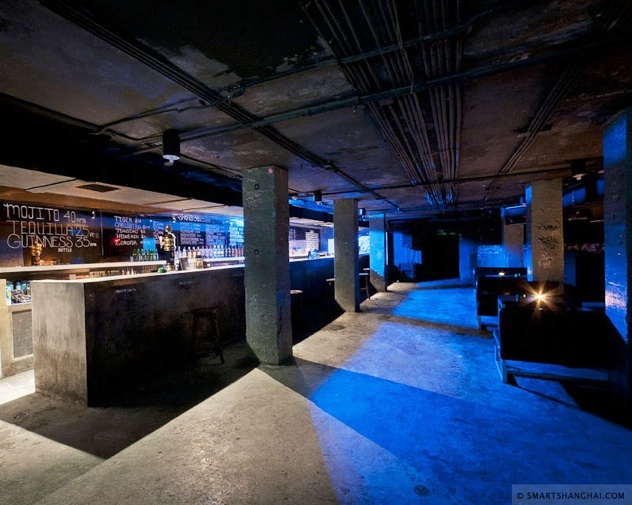 The atmosphere inside the nightclub is dense and moody, echoing with pounding drum and bass tunes—the perfect location for all-night partiers. 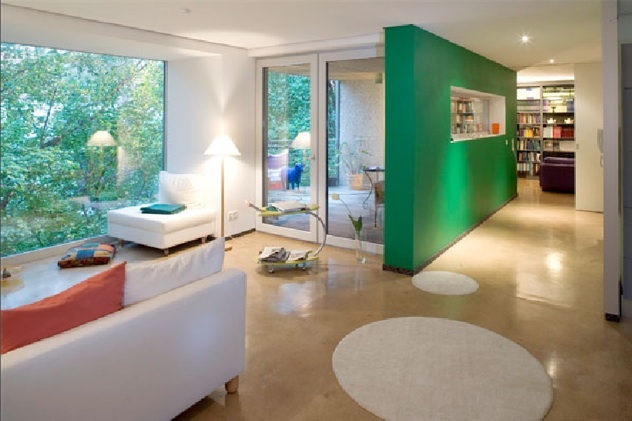 Most of the original cement structure is left visible, but combined with 21st century furniture and interior design, not to mention some of the best sound systems in the area. 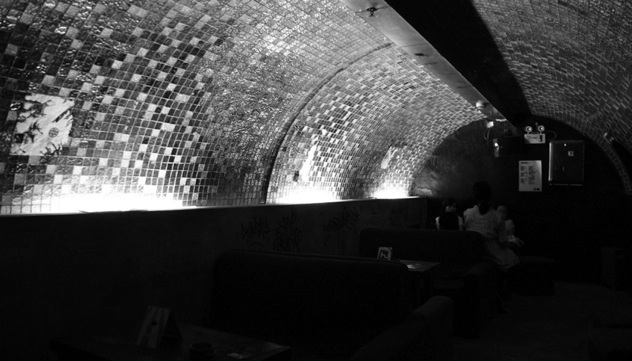 Some sections rely heavily on the intrinsic nature of the bunker—”dark rooms,” with no light at all, just the music. 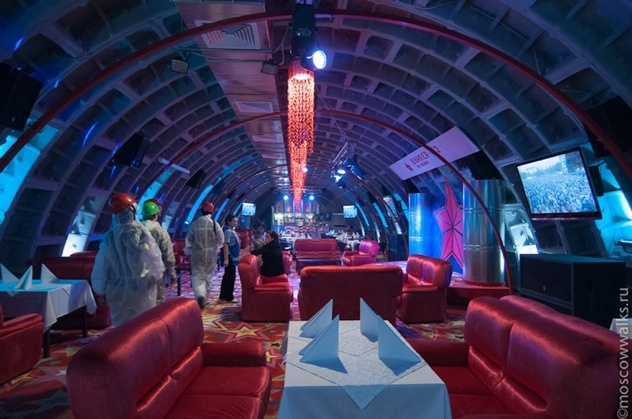 China isn’t the only country cornering the market on bomb shelter night life—on the other side of the imaginary Cold War conflict line, Moscow is joining the arms race with its own specially designed bunker. Bunker 42, formerly known as the Tagansky Protected Command Point, was built in the 50’s and operated up until 1986. 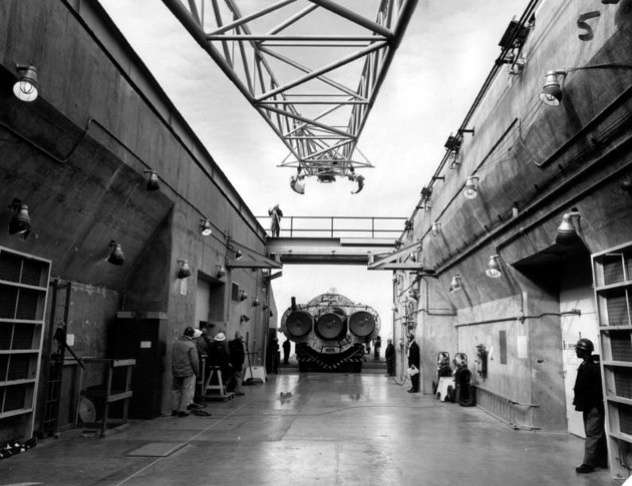 The massive underground space (7,000 square meters, or 75,000 square feet) was designed so that 3,000 military officials could survive for three months without resupply. Now, it’s a bar, club, and restaurant. 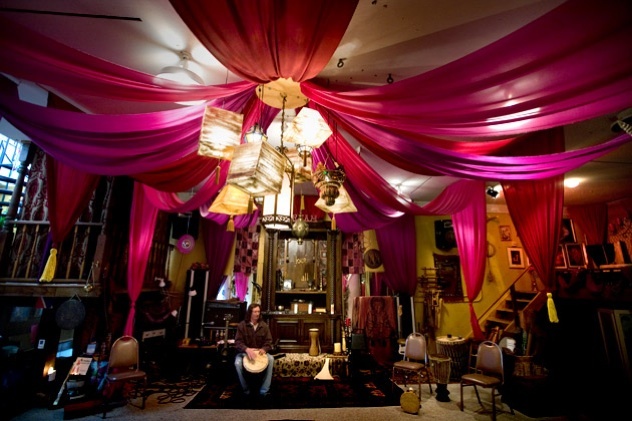 It’s actually still in development, but the design is evolving into something that looks like a set piece from 2001: A Space Odyssey, especially the main lounge area, which was placed inside a long hallway with curved ceilings, complete with signature Russian opulence in the furniture and decor. While most of the bunker is being reimagined as a club, a small part will be retained as a Cold War museum. Bomb shelters aren’t the only remnants of modern warfare—missile silos also played a deadly role in the clash of superpowers. And they present some very unique opportunities for remodeling. The SiloHome is built from an abandoned missile silo in Saranac, New York. Although the silo reaches an incredible 185 feet (56 meters) below ground, only the top two levels have been converted into living quarters. The best part about the home is that—except for the wooden lodge above it—the entire structure is underground. And like any good bunker, it was built to withstand a nuclear attack. You enter through the above-ground lodge (which, it has to be said, is a very decent home on its own). Inside, a keypad encoded steel door swings open into a stairwell that takes you down to the first two floors of the silo, outfitted with every modern convenience you could ask for—yes, even a jacuzzi. This 19th century fortification isn’t quite as ritzy as some of these bunkers, but what it lacks in glamor it more than makes up for in elegant style. 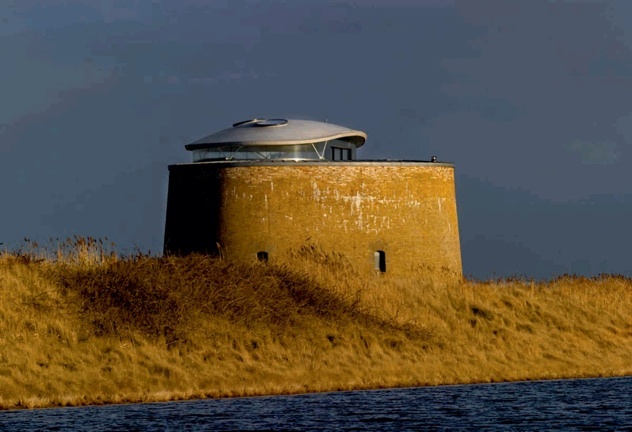 The once-derelict tower sits on the picturesque coast of Suffolk, England, and for the longest time it was preserved by the English Heritage and Suffolk Coastal District Council as a national monument. When it was bought by the architectural firm Billings Jackson Design, the plan was to turn it into the private home for the owner of the company, Duncan Jackson. The remodeled tower preserves the original brickwork, and the outer walls are almost unchanged, providing a stark contrast between the early 19th century style as seen from the outside and the sleek modern view from the inside. 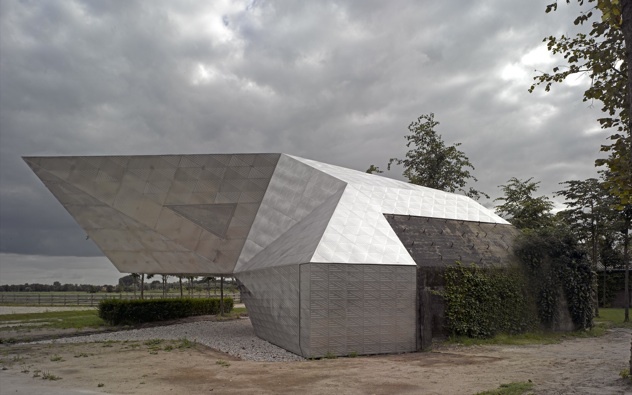 The Tea House On Bunker in Vreeswijk, The Netherlands beautifully proves that bunker renovation doesn’t need to stick within the boxlike confines of the original structure.The bunker was built in 1936 as part of the line of defense along the New Dutch Waterline, mentioned in entry number nine. The project, developed and implemented by UNStudio, aims to alter the original structure of the bunker as little as possible, and it achieves that goal through a removable stainless steel installment that fits over the top, clicking into place like a couple Lego bricks. 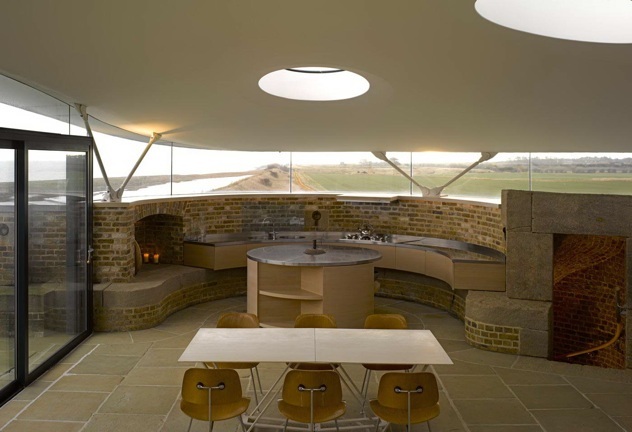 Using the grounded weight of the bunker as a counter balance, the steel structure is able to jut out at an angle that seems to defy the laws of physics, giving the Tea House its unique profile. As a result, the actual meeting area (it was designed for business conferences) is left hovering over a 6 foot (2 meter) block of empty air. Germany has, arguably, more derelict WWII bunkers than any other country. There are thousands of the structures across the country, and while many of them are left standing because they represent historical landmarks, others are still there simply because demolishing them would be an expensive process—they were, after all, built to withstand bombs. 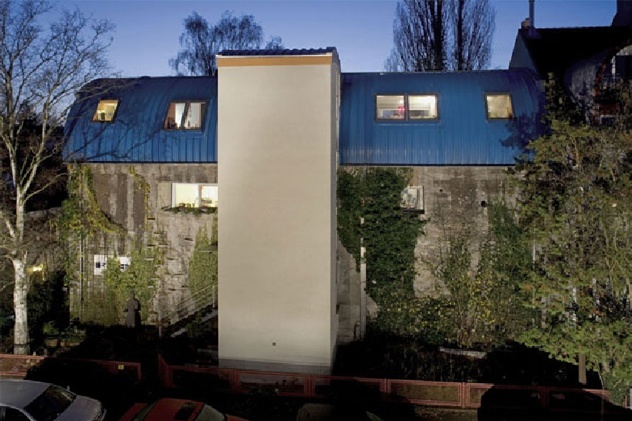 A German architect named Rainer Mielke is doing his part to contribute to a solution by recycling some of them into apartments. He calls the project Bunker Wohnen (bunker dwelling, or bunker habitation). His apartments utilize the upper floor of the bunker along with an additional level built onto the roof as the living space, while the lower level is used as a parking garage for the residents. When one of the residents, Hans-Albert Eike, moved into the refurbished bunker, he invited the neighbors over for a housewarming party—and actually met several people who had used the bunkers as children during WWII. During the Cold War, the U.S. government spent billions of dollars peppering the Midwest with missile silos. Some of them were so large they were practically cities buried deep beneath the ground. One of these hardened bunkers, in Topeka, Kansas, was specially built in the 60’s to accommodate a 4 megaton Atlas E nuclear missile—and nearly two decades later, the then-abandoned silo was bought by a schoolteacher named Ed Peden. 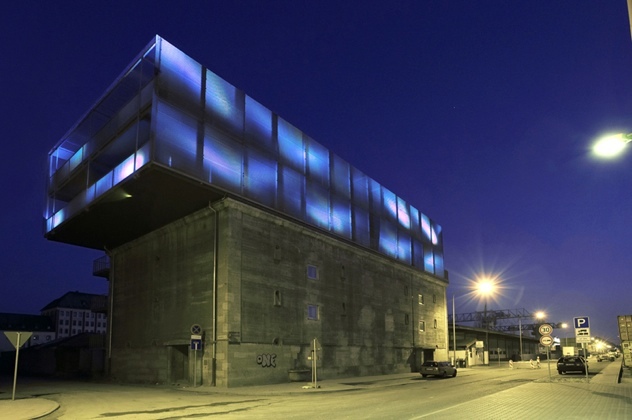 Finally, one of the most impressive repurposed military bunkers is the Bahnhof Data Center, built inside an old Cold War era nuclear bunker 99 feet (30m) below the surface of Stockholm, Sweden. 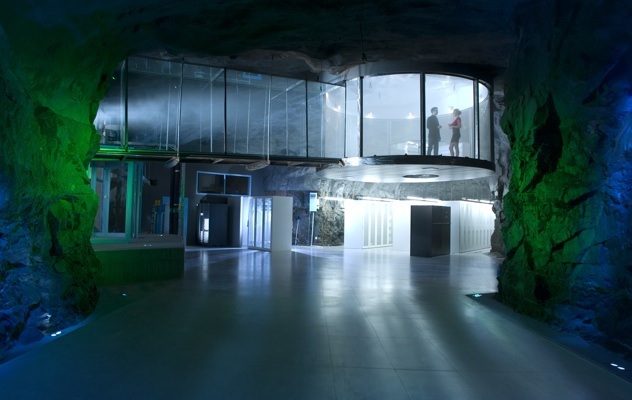 When Bahnhof, a Swedish internet service provider, purchased the bunker, they decided that with such a uniquely eccentric location at their disposal, they might as well design it to harmonize with that, frankly, villainous ambiance. So Bahnhof went all out. The photo above offers a glimpse into the facility, but with over 1,100 square meters (nearly 12,000 sq. ft.) of space in the bunker, a glimpse is really all it is. Since the workers are underground, the bunker has simulated daylight, a series of greenhouses, and waterfalls flowing directly out of the walls. Beautiful, yes, and also nearly impenetrable—the front door is 40 cm (16 inches) of solid steel, and the facility itself was built to hold up against a direct hit from a hydrogen bomb. That security isn’t wasted either—the Data Center also houses private servers, including the sensitive servers for WikiLeaks.